FILE - A United States flag flies in front of the U.S. Capitol dome in Washington, Nov. 6, 2018. U.S. lawmakers of both parties are weighing in on what they would like to hear from President Donald Trump's State of the Union address Tuesday evening. 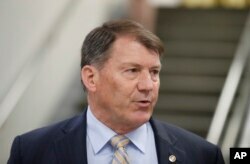 South Dakota Republican Senator Mike Rounds is urging Trump to deliver an uplifting speech, saying the president has many reasons to be proud. "We've revised our [federal] tax code, we've got an economy that is growing, record low unemployment, regulations that have been eliminated on the American people, and conservative judges on the Supreme Court and the other courts," he said. Democrats, like Senate Minority Leader Chuck Schumer, paint a different picture of the Trump presidency. "The state of the Trump economy: failing America's middle class," Schumer said. "The state of the Trump administration: chaos. The state of Trump foreign policy: woefully backward, inside-out. Knowing this president, he will rely on distortion and made-up facts, mislead the American people." On Monday, the Senate advanced legislation cautioning the administration against rapid U.S. troop withdrawals from conflict zones. Kentucky Republican Rand Paul wants Trump to hold firm. "I think we'll hear him continue to talk about ending some of the wars we've been involved with for so long. I think he'll talk about how we're going to bring troops home from Syria and Afghanistan," Paul said. The presidential address comes as congressional negotiators face a Feb. 15 deadline to keep the government funded and resolve a partisan standoff over border security and a border wall. Democrat Ben Cardin of Maryland says Trump's actions matter far more than the words in his speech. 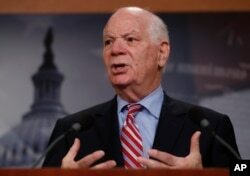 FILE - Sen. Ben Cardin, D-Md., speaks during a news conference on Capitol Hill in Washington, May 24, 2017. "I would like to see deeds," he said. "And first and foremost, remove the threat of a government shutdown. Relent on the way he is trying to get money for his [border] wall." The president has repeatedly hinted he may declare a national emergency and bypass Congress in order to construct physical border barriers. Such a declaration would be premature, according to North Dakota's new Republican senator, Kevin Cramer. "It would be a mistake to do it tonight, in my view, because Congress has until February 15 to get it right," Cramer said. "He and [House Speaker] Nancy Pelosi ought to give the conference committee room, perhaps with gentle persuasion, to come up with a bill that we can all agree on." Not all senators wanted to speak out about the State of the Union. Idaho Republican James Risch would only say that Trump is in charge of his speech, and lawmakers should wait to hear what he has to say.